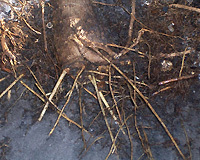 Pruning roots that grow on the periphery of the root ball is best accomplished by shaving the root ball. Potential stem girdling circling roots, and roots that dive down the side of the container, are removed. Slicing radially appears to be less effective. 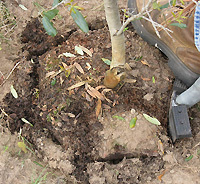 New roots growing from the periphery of the root ball in response to shaving at planting.